GYM CLOSED NEW YEARS EVE AND NEW YEARS! The gym will be closed Monday the 27th for Memorial Day. 24th - 27th - No Preschool Academy! Classes will resume Tuesday, May 28th. GYM CLOSED JULY 2nd - JULY 6th! CLOSED FOR LABOR DAY Monday, September 3rd! Closed at 4:00 PM October 31st. NO EVENING CLASSES! NO CLASSES, OPEN GYM OR PARENTS NIGHT OUT! 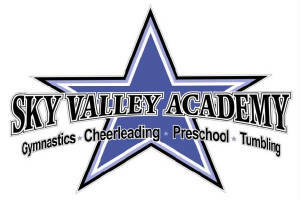 Sky Valley Academy follows the Monroe School District for school closures due to inclement weather. Information will be posted on the site with important information pertaining to your childs' class. We will also post to the School and Gym Facebook page.